As of 2016, around one million books are published annually in the United States. Is this thing on? One million. Every year. I cannot make sense of that, but there it is. The term glut hardly covers it. The majority of ebooks I own were either free or less than $1.99. Many of the books I have in my humble home library were either given to me or purchased for less than $10. Rumors of the printed book’s death have grown and spread like kudzu for years, though Samuel Clemens might suggest they’re exaggerated. People now perceive little value for a book. I’ve heard people question why anyone would read a book when you can always Google anything you need to know. Though the Bible is still the best selling book, it may also be the least read. Lifeway Research conducted a survey designed to be representative of the United States and found 10% of people had never read the Bible at all. Only 11% had actually read the entire Bible and only 9% had read it more than once. The largest group was 30% of those surveyed who answered they had read several passages or stories from the Bible. Despite not reading it, 87% percent of households own a Bible and more than half have a positive view of it and think it’s valuable. You might think I’m going to bewail biblical illiteracy, and it is tempting. I have quite a different track in mind. With facts staring us in the face, I ask, is it reasonable that the all-knowing, all-powerful, all-present Creator of everything would give us a book about himself? Books are about as abundant as dirt on the earth and probably only slightly more valuable to the average earthling. Many people will say the Bible is valuable, but it’s obviously not valuable enough to read. Why would God give us a book about himself that few would pay any attention to? We first must think, not about a book, but about knowledge. We bring nothing into this world with us. Though we are designed to breathe and transition naturally from fluid to breathing air, we don’t know what air is. We don’t know what breathing is, nor why it is so important? We are born knowing nothing. Everything we have come to know by the time we die, we have learned from somewhere. The knowledge we gain will have much to do with the nature and form of the information available to us. Some things we find out through observation and exploration, but many things we have to be told. We can observe the creation around us and infer a powerful and wise Creator (Romans 1:19-20). Creation is a form of revelation, but it leaves much unknown. What sort of Creator has made everything? Is he holy, righteous, just? Does he have wrath and love? How can we creatures serve and please him? Does he even care or notice whether we do? What about heaven, hell, life after death? Why do we die at all? Having a conscience, we know guilt, but can guilt ever be removed? Is the Creator changing or unchanging? So revelation of some kind is necessary. We cannot find out such things by merely watching the sun rise or staring at stars in the night sky. I hope we can agree that some form of revelation is necessary for us to know truth about our souls, life, death, and judgment to come. But, what form should necessary revelation take? God could give immediate revelation to each individual. The problem is obvious. The party of the first part has received revelation A, while the party of the second part has received revelation B. When A and B are not equal, and may even be in direct opposition, where does that leave us? How could we possibly know which is right when one says one thing and another something else? Alternatively, God could give revelation to a few different ones and that revelation be handed down through oral tradition. This still ends up with the same problem. There is no fixed standard, so how could differences be resolved? When one claimed to speak revelation, how could it be verified? Another obvious problem would be how to deal with charlatans and deceivers. Without a fixed standard, we are ten-year-olds shoving each other on the playground. A fixed standard of revelation is then necessary. How are we to know and be assured of truth? God has given us a written word that is sufficient for everything we need (2 Timothy 3:16-17; 2 Peter 1:3-4, 16-21). A fixed, written standard is not only necessary, but reasonable and indispensable. 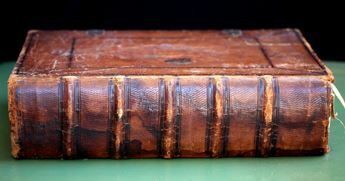 Some would object: if there is an infallible, inerrant, fixed, written standard, then why are there so many different sects, denominations, and groups who all claim to be following the Bible? Why so many interpretations that vary widely and even contradict each other? Let’s consider a couple of things here. First, finding fault with the Bible because different people think it says different things is kind of like finding fault with genuine currency because of the existence of counterfeit bills. Do we doubt the validity and worth of a real Ben Franklin because of a plethora of fake C-notes? Let’s look at it another way. Say you have a sealed room with one way in and out. In the room you have placed a book and you have selected a dozen people at random. You send the people into the room one at a time to read the book. Afterward you quiz the participants about what the book said, and you get six or eight different interpretations of what was written in the book. Is it more reasonable to think the difference is in the book or in the people? That brings us to the next consideration of why so many different interpretations exist. Second, the diversity of interpretations is due to the noetic effects of the fall and man’s imaginative capacity. The term noetic refers to the intellect and the fall refers to the fall into sin and the damage of depravity because of it. Man’s intellect is affected by the fall and one proof is that it is possible for a man to think of a lie and possible for a man to believe a lie. Why, it’s not only possible, but I’ve seen it done. So man has the capacity to conceive of lies and to believe lies. Man also has an imaginative capacity that is capable of thinking of the impossible. He can imagine something in his mind that does not exist, and maybe could not exist for various reasons. Not only can he imagine unreality, but he can hold true, untrue, real, and unreal thoughts in his mind simultaneously. Let me illustrate. Imagine a wrought-iron patio chair. It’s not hard. Maybe you have one, or your grandmother did. You can think of the white lacquer paint and the rust stains. You can envision the cracks in the paint and the places where the metal is exposed and smooth from wear. You can think of the heft of the chair and how solid it feels to sit in. Also imagine a purple unicorn. The beast can be solid, striped, spotted, piebald, or whatever you like. Think of the mane, tail, and the horn protruding between the ears atop its gallant head. Imagine the hoofbeats as it trots around the yard, or the crunch of the apples it eats off the tree. Now imagine the unicorn sitting in that wrought-iron patio chair. Silly image, isn’t it. A unicorn sitting in a chair is funny, but you did it. You saw it in your mind. You just illustrated to yourself why there are so many different interpretations of the Bible. You just simultaneously imagined something real, the patio chair, and something not real, the purple unicorn, and brought them both together, the unicorn sitting in the chair. That scene does not exist, has never existed, and will not exist, but you saw it. The fact that you put a unicorn in a patio chair does not mean there is something wrong with the chair, or that patio chairs are not real. I’ve gone long, so I hope the roast won’t be tough by the time you get home to it. I think I have demonstrated somewhat the reasonableness and necessity of a fixed, written standard. Our thinking doesn’t always go straight and we need something to inform and correct us. A written word is also necessary because we need something to go back to because we are so prone to forgetfulness. We need reminding and we need to remember. So, God has given us his word (1 Timothy 4:6; 2 Timothy 2:14; Hebrews 10:32; 2 Peter 1:12-13, 15; 3:1). God has given us a book, so read it and then read it again.